Scheduling volunteers is probably the least favorite part of my job. It's not that I don't like my volunteers, but keeping track of the schedules, and keeping everyone on the same page is a big job. Now that I've taken on scheduling the support teams, the list of volunteers I'm responsible for has grown quite a lot. I've tried a lot of ways to keep the schedule straight, and the biggest problem is making sure the volunteers have the dates they need. More than once, I've been at church calling a volunteer and asking, "Are you on your way?" Often the response is, "Oh, am I on today?" So in an effort to keep this from happening, here's what I've come up with. The solution for me, so far, has been part product, and part procedure. I have tried using calendars, but I find them cumbersome. I prefer to have the list of dates listed out in a spreadsheet. Originally, I kept the spreadsheet on my laptop. Now, I keep it on Google Docs. Having it hosted on Google Docs gives me the advantage of being able to share the schedule with the team. I can edit the sheet from anywhere, and the team can bookmark it and see when they're on at any time. The spreadsheets in Docs are very similar to Excel or Numbers (and you can upload an existing sheet very easily, if that's how you already keep your schedule). 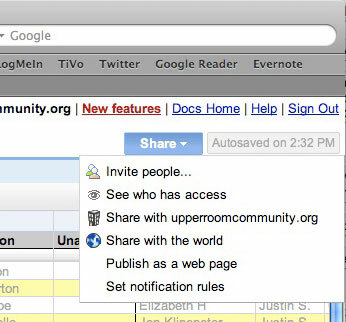 Sharing the sheet is a simple matter of clicking on the "Share" tab. We used the hosted app feature of Google Docs for our church, so we can share docs easily with other users in our domain. But it's also easy to share with others outside the domain. And if you don't want to host your mail there and use the domain feature, you can set up a single user and do the same thing. Once you invite people, you can decide if they can edit the sheet, or just view it. I have our schedule set up so that I can edit, as can our Creative Director and volunteer producers. Everyone else just gets to view. You can also publish the sheet as a web page, and you can easily send anyone a link to the page (which is what I do with our support teams). 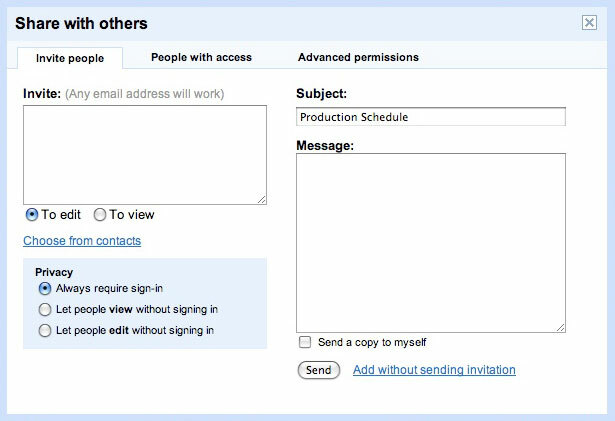 Because one of the pages on our production schedule has everyone's contact info, I have that set up so people have to be invited to view. The system creates a unique link for everyone that provides some level of security. 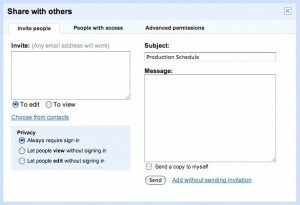 Another nice feature is the ability to send an email to all the collaborators and viewers with a single click. The only limitation is that you can't select individual viewers, or email a subset of the list. That's how we do it; here's what we do. I'll start the scheduling process by asking people to send me dates for the next 3-4 months that they know they are unavailable. I have an "Unavail" column in my sheet, so as those dates come in, I add the names as appropriate. We run our lighting and presentation teams on a 1 week on, 3 weeks off schedule, while sound is 2 on, 2 off. I start by populating the sheet with that pattern, and make adjustments as needed to move around unavailable dates. Once I'm done and all the slots are filled, I'll use Google Docs to send an e-mail to everyone and have them check out the schedule. Often people are reminded of a date they can't work, so end up making a few adjustments. Once we get through that round, the schedule is "fixed." Any changes from that point on need to be swaps between team members. They then e-mail me of the change, and I adjust the schedule. Every Tuesday, I send a quick reminder e-mail to the team scheduled for the upcoming weekend. I ask them to ping me back as a confirmation. When they do, I bold them on the schedule. That way, others on staff can see who's in for the weekend. If I don't hear back by Thursday or Friday, I try again, or call. The team is used to this now, and normally I know by Wednesday morning that everyone's good to go. And that's it. It takes a few hours to work out the schedule initially, but once it's done, it takes less than 10 minutes a week to manage. I follow the same basic procedure for the support teams, but because they run on a fixed team-based 3 weeks on, 3 weeks off schedule, the dates are set for the ministry year. I still send out confirmation e-mails weekly, however. We also use Google Docs for creating our cue sheet for the week. That is shared with the team on Friday when it's done. I typically create an input list (in Google Docs) on Friday as well, and send that out to the sound team, so they can see what they're walking into. I live by the motto, more information=good. While it's not a perfect solution, it works pretty darn well. And it's free. As in nada. So if you're a smaller church that's looked into those hosted solutions, but just don't have the budget for it, check Google Docs out. There is a hosted solution that I do really like, and I think we'll be transitioning to it in January. 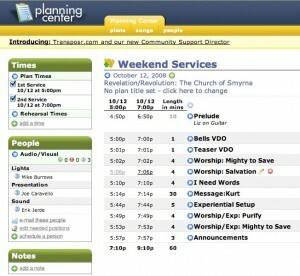 It's called Planning Center Online. 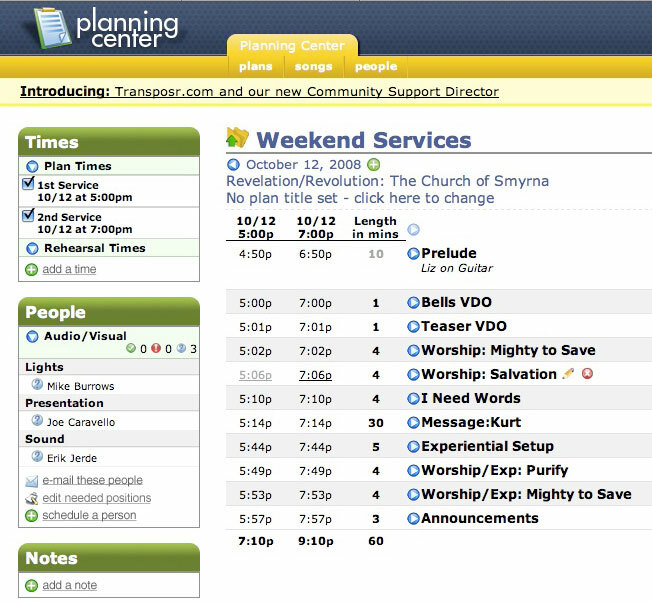 It's built from the ground up to help churches organize their people and their service documents. It offers scheduling, charting, service planning, and even streaming MP3s for the band and tech team. You can share files and even transpose charts. It's really slick. Best of all, once you build the schedule, the system automatically sends reminders out to the team, and the team clicks back in to confirm. There is a cost, but it's pretty reasonable. They have a free version (which is limited to 10 people) and other versions have a 30 day trial. Since it costs nothing to try out, give that shot, too. So there you go. Two ways to improve your volunteer scheduling. I've found this to be a huge boon to my ministry. By communicating well with my volunteers, they feel cared for and valued. And by having a good system in place, I spend less time on this task, and I get a full crew almost every weekend. Give it a shot.